From past to present, how has Dahlgren School made a difference in the lives of its teachers and students. 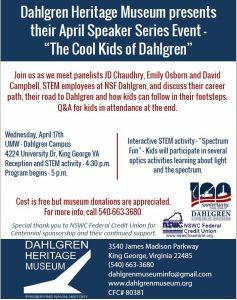 Come and reminisce with a panel about all things Dahlgren School. 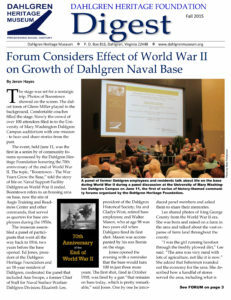 Meet members of families whose family’s land became the Dahlgren Navy base. A panel discussion about the displacement of residents during the establishment and expansion of the base. We will partner with the Ralph Bunche Alumni and the King George Historical Society. This panel will include former Dahlgren employees Sheila Young and Ann Tate, and current employees Shellie Clift and Meredith Bondurant. In honor of Women’s History Month, enjoy the story of four formidable women that shaped history at Dahlgren.